The small town of Midway, B.C. has partnered up with savvy small wood experts Vaagen Bros. to produce Canada’s newest sawmill, utilizing HewSaw equipment and a squad of very enthusiastic local contractors and suppliers. In an industry that is still in the midst of recovery mode, the start-up of the sawmill in the small town of Midway, B.C., comes as tremendous news. It’s the story of a town that never says die partnering up with a sawmill operator that epitomizes the term, “small wood experts”. But it has been a haul. Just ask Mark Deverson, the plant manager for Vaagen Fibre Canada, whose task has been to take a sawmill that has been shut down for four years, figure out what is salvageable, and then bring a brand new small log mill into production. Deverson recalls his first day on the job, in early May. “This place was pitch black. We had no lights—we had to walk around with flashlights for three days before we were able to turn on the some MCCs and get some light. We had one small explosion because copper thieves had cut through one of the cables. We had some adventures. “Like I tell my boss, Russ Vaagen, this is the hardest thing I’ve ever done, but it’s the most fun I’ve ever had,” says the enthusiastic Deverson, who grew up in a relatively small sawmill town himself, Fort St. James, B.C. 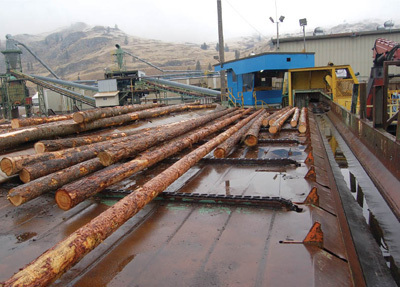 Oregon-based Pope & Talbot Inc., who owned the Midway sawmill, which is located in B.C.’s Southern Interior, and operated it for close to 40 years, went under in 2007. Another company, Fox Forest Products, bought the sawmill, and briefly operated a pallet manufacturing operation there, before shutting that down. Vaagen Bros., who are operating the Midway sawmill, are specialists in small log sawmilling, with two small log mills in Washington State—and they are huge fans of HewSaw equipment. The HewSaw unit they installed at Midway (above) was basically made into what HewSaw calls a sawmill racehorse. All of the 125 hp motors were upgraded to 250 hp, for a total of 1400 hp on the unit. Deverson noted the mill was the victim of the massive industry downturn, rather than being poorly operated. “When the Midway mill went down, it was a well producing mill,” he says. “The last numbers on the last shift on the production clock—and remember they weren’t running the headrig then—was 275,000 board feet for the shift. Just how big a fan are the Vaagen Brothers? “They’ve restored the first HewSaw they bought years ago and put it in their cabin,” says Deverson. The HewSaw unit they installed at Midway was part of a larger purchase of HewSaw equipment from Domtar some years ago but it was never used. “Vaagen Bros brought it up here, sent it to HewSaw in Vancouver, where it was stripped down completely, right to the frame,” explains Deverson. “It was basically made into what HewSaw calls a sawmill racehorse. 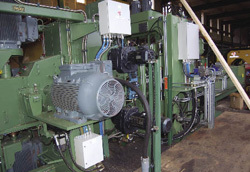 All the 125 hp motors were upgraded to 250 hp—there is a total of 1400 hp in that one little unit.” Prologic+ provided the log optimization going into the HewSaw. They also bought a HewSaw log turner from Finland, which Deverson said is “amazing”. “I’ve been in sawmilling all of my life, and when I saw one of those log turners running on YouTube, my jaw hit the floor. I have not seen anything like that, and now we have one.” Five bins will batch feed five separate log diameters into the mill. The Midway mill does not have any tenure. 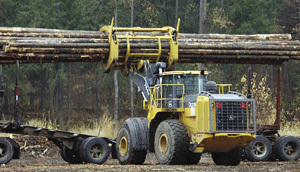 Timber is sourced through private timber sales, and they work with woodlot owners. And the mill also does a fair bit of trading large logs for the smaller logs then need. “Other mills don’t want the smaller stuff, and we don’t want the large stuff, so it’s a win-win,” says plant manager Mark Deverson. All of this was done on a relatively shoestring budget—about $8 million. “We’ve got a very tight budget compared to the Canfor’s and Interfor’s of this world.“ Deverson says they have had to be very resourceful to work within that $8 million budget. Case in point: they backfilled the basement of one of the sawmill buildings they removed so they could get the crane in closer, so they could use a smaller crane. “We were able to get a small crane from Gwil Crane and pull it right in to get the existing machinery out and get the HewSaw equipment in,” he explains. 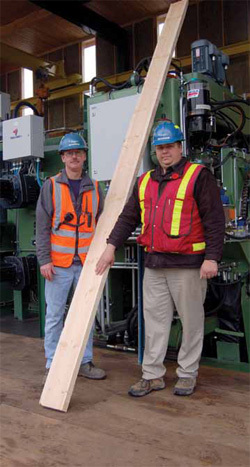 Midway plant manager Mark Deverson (right) with Neil Horkoff, mill maintenance superintendent, with the very first piece of lumber produced at the sawmill. Before installing a single piece of equipment, they took out a fair bit of the original mill, about 45,000 square feet. “We did not need the old building. It was in bad shape, with water pouring in through the roof. And we now have bins three, four and five where the old building was.” These three bins accompany the existing two log bins. They were able to generate some revenue from the demolition. Two old Mark II Chip-N-Saw systems were sold, as was the USNR edger optimizer system. The old 24 inch square fir timbers from the old portion of the building were snapped up quickly. With that done, they worked in a bit of the new with the existing equipment. They installed a new slash deck system, they have two existing A5 debarkers that will be used, and the existing trim line and 65 bin sort system are both being used, as is an existing revolving log loader system. “When the mill was shut down, this equipment was left in great shape, and that has really helped us,” says Deverson. The new, small log equipment has required a change in approach at the mill, Deverson says. “If the Mark II equipment went down for five or ten minutes, you lost 20 logs. If the HewSaw goes down, and we are running the 2 X 4 pattern with the smallest logs, we will lose 20 logs in one minute. As for Vaagen Bros, which is based only an hour away from Midway, “not only are they putting their money and expertise into the project, they are putting their heart”. 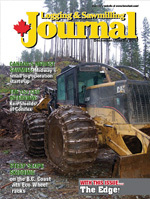 Expert small log sawmillers Vaagen Bros. have been looking to expand into this area of B.C. for years. “They knew there was a lot of small timber here that no one was using, and no one wanted.” Vaagen Bros. worked on coming up with a deal with the mill’s owners, Fox Forest Products, a few years’ back, but that did not come together in the end. It took a separate company, Boundary Sawmills Inc., owned by investors from the towns of Greenwood and Midway, to buy the mill. It has leased it back to Vaagen Bros. Lumber produced at the mill will be trucked to the Vaagen Bros. mill in Colville, which has a brand new Coastal planer that is not running to capacity. “We’re going to do that for now,” says Deverson. “But if the lumber market goes well, hopefully we’ll put on a second shift at Midway in June. And our long term goal is to produce so much wood that they can’t keep up with the planer in Colville, and we’ll be able to start the planer here. The mill does not have any tenure. Fibre procurement specialist Chris Waters sources wood through private timber sales, and works with woodlot owners. And they also do a fair bit of trading large logs for the smaller logs then need. “They don’t want the smaller stuff, and we don’t want the large stuff, so it’s a win-win,” says Deverson. The plan is to complete the installation of the three new bins, install some specialized high speed unscrambling equipment to feed the infeed, and start out producing steady. “We’re looking to be running full tilt in January,” says Deverson. And the sawmill has 42 new and dedicated employees—some of whom worked at the predecessor Pope & Talbot sawmillare working very hard to achieve that goal. Kettle Valley Electric -Supply and installation of electrical equipment for new merch and whole log chipping system. Varsteel -Steel supplier – building and machine frames.